QMHW 2016 Achievement Awards winners announced! 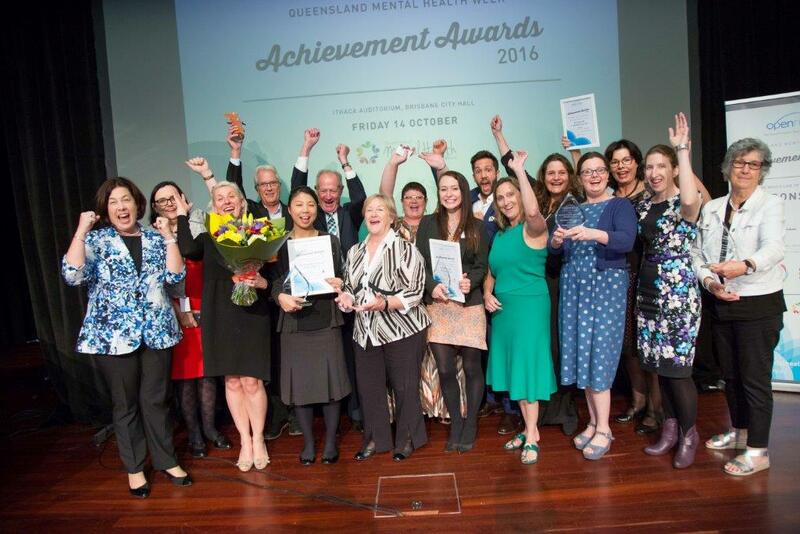 Celebrating our Queensland Mental Health Week Achievement Awards Heroes! Congratulations to the winners of the #QMHW Achievement Awards. Individual Award – Ms Annette Coutts, for her work as a consumer advocate at The Park – Centre for Mental Health, Treatment, Research and Education. Annette draws from her lived experience to provide empathetic support and effective advocacy for consumers and carers. Media Award – ABC QLD ‘Heads Up’ TV Special was a collaborative news event discussed across multiple media outlets, including television, radio and digital. The TV Special explored youth mental health and wellbeing issues, focusing on two questions: What’s happening to our kids? What are we doing about it? Youth Award – Ms Teneille Arundale, for her work with Harmony Place, a community-based organisation providing mental health and wellbeing services for people and communities from culturally and linguistically diverse backgrounds. Teneille is passionate about humanitarian efforts, community development and improving the lives of others. Jude Bugeja Peer Experience Award – Mr William Smith-Stubbs, for his work on various campaigns promoting mental health awareness and help-seeking behaviour. William is Co-Founder of Spur Projects, producing a wide range of innovative mental health projects giving men resources, skills and language they need to take positive action around their mental health. William draws from his own lived experience to help others. Not For Profit Small-Medium Award and the Earle Duus Award – The Pharmacy Guild of Australia (Queensland Branch) worked closely with four Primary Health Networks to supply mental health education and training to staff at 100 pharmacies through the Partners in Recovery Pharmacy Integration Programs. The programs aimed to improve collaborative care between pharmacies, pharmacy staff and mental health support providers and improve the knowledge, skills and attitude of pharmacy staff to better support people with a mental illness. Not For Profit Medium-Large Award – Aftercare and Arafmi Queensland partnering since 2014 to deliver support services to family, friends and carers of people experiencing mental illness. Together, they provide carers with a range of information, skill building events, connection with other carers and connection to other relevant community support services. Workplace Small-Medium Award – Labrador State School aims to promote mental health and wellbeing and reduce stigma associated with mental illness by delivering a week-long series of events and activities during Queensland Mental Health Week specifically developed to educate their students, educators and the school community about mental health issues. Workplace Medium-Large Award – McCullough Robertson Lawyers provides a range of mental health and wellbeing initiatives to support their 400+ staff across Queensland and New South Wales. They aim to provide an inclusive work environment that is safe and supportive. Well done also to the nominees and finalists, all of whom have made an incredible contribution to improving mental health and wellbeing in Queensland. You’re all winners in our eyes.